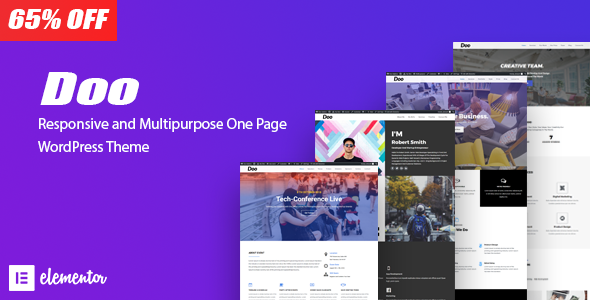 Lila is a creative multi-purpose WordPress Theme based on Elementor Page Builder designed with terrific attention to details, flexibility and performance. It is ultra professional, smooth and sleek, with a clean modern layout, for almost any need: agency, freelance, blog, startup, portfolio, app and corporate. Build beautiful, intelligent websites. A flexible one + multi page website can do anything with the power of WordPress, no coding required! If you want a beautiful looking, fast loading, optimised for search engine, packed with lots of features One Page and Multi Pages Website, or you need a Personal Website that conveys a creative message and displays your work portfolio at its absolute best then your search should end at Lila Theme. With lila theme ready made demos to quick start your online presence with an awesome showcase of your work. With your purchase you also receive the industry leading Page Builder ‘elementor’ so that you can create the ultimate and perfect page for your needs with the absolute simplicity of Drag & Drop.